UMass scientists create a digital Noah’s ark. Essentially, we are saying we are so worried about these animals that we are taking the trouble to go around the world and preserve them digitally so future generations can know them. Duncan J. Irschick is on a mission: to digitally preserve life before the forces of extinction prevail. His weapon is the Beastcam, an ingenious rig that uses technology to capture high-resolution 3-D photographs. Scientists estimate that between 150 and 200 plant, insect, bird, and mammal species become extinct every 24 hours; climate change and habitat destruction are accelerating the crisis. Determined to create a Noah’s ark in cyberspace, Irschick, a professor of biology at UMass Amherst, and his undergraduate students invented the octopus-like Beastcam, loaded with 30 cameras on 15 arms. Irschick’s goals for the venture, called Digital Life, are impressive: he wants to preserve all living things on the planet as 3-D models, starting with endangered species of sea turtles and frogs. “Essentially, we are saying we are so worried about these animals that we are taking the trouble to go around the world and preserve them digitally so future generations can know them,” says Irschick. Irschick brings the Beastcam, which can photograph in split seconds creatures as tiny as several centimeters or as large as sharks, with him when he travels. The device uses a photogrammetric process, integrating multiple 2-D images into a single 3-D model. “This technology can recreate organisms in a way that has never been done before,” says Irschick. The Beastcam is Irschick’s second internationally acclaimed invention since joining the UMass Amherst faculty in 2006. With UMass professor of polymer science and engineering Alfred Crosby and others, he co-invented some aspects of the Geckskin technology, a super-adhesive inspired by the anatomy of gecko feet. Professor of Biology Duncan J. Irschick (right) with a handheld Beastcam designed to rapidly create 3-D models of living animals. 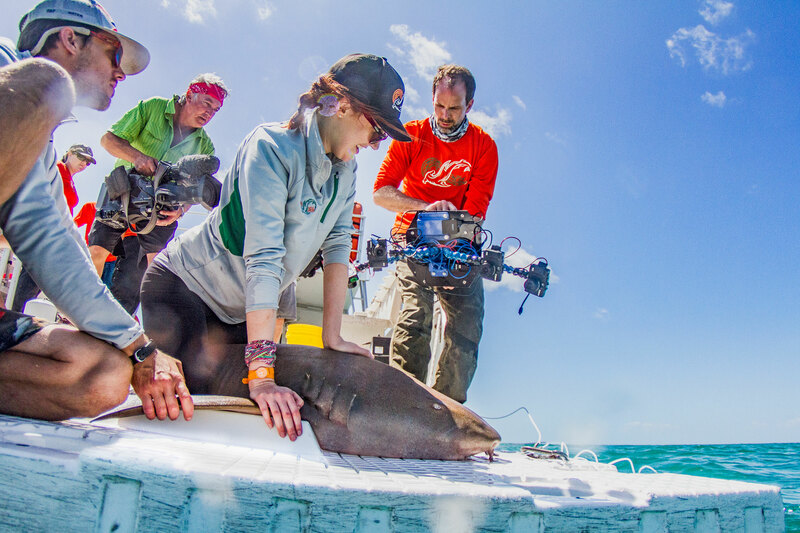 A Discovery Channel crew filmed Irschick and a team of biologists as they scanned and released a nurse shark in Florida. Irschick and his team of UMass Amherst scientists, students, and researchers around the world expect the Digital Life project will present opportunities for discovery, as well as for preservation. For example, knowledge is scant about some sea turtle species, such as the leatherback, which can grow up to 3,000 pounds and has a unique, leatherlike shell. The shell may hold the clue as to why the deep ocean animal can swim long distances. “With a 3-D model, we can actually study the structure of these animals,” Irschick says. The models can be used to develop new theories of animal movement and body shape. For the sea turtle project, the UMass group has partnered with several conservation organizations, including the World Wildlife Fund of Greece. 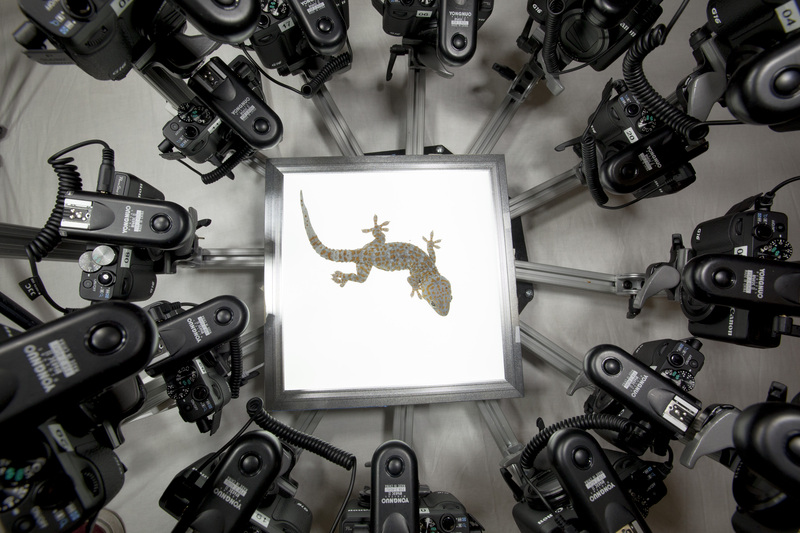 The Beastcam can make 3-D models of animals large or small, such as this tokay gecko. Beastcam photographs and models are on the Digital Life website, where students, teachers, and the general public can download the models. Irschick believes the project will provide countless teachable moments, including at the Museum of Science in Boston, which will feature an exhibit on the project in 2018. Red-eyed tree frog photo (top) courtesy of the Digital Life project.